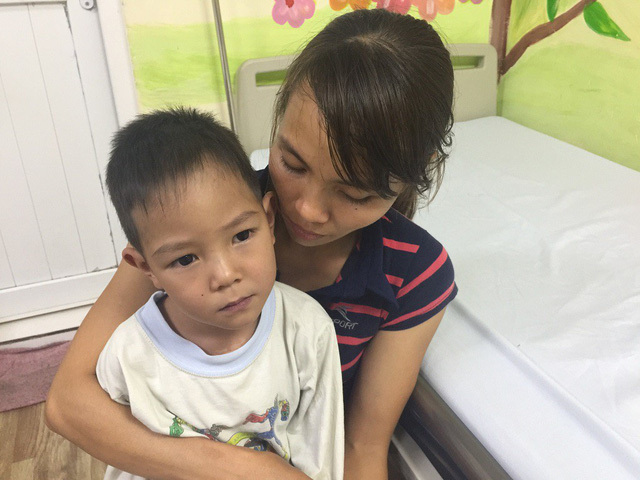 A couple in Ha Nam Province are calling for financial support to help cover treatment for their five-year-old son who is struggling with heart disease. Tong Cong Viet weighs only 12kg and has gone through four operations. Nguyen Thi Thuy, Viet's mother, said, "I'm scared. He has breathing difficulties while just sitting alone. He is scheduled for a fifth operation but we have no money left." Viet was diagnosed with transposition of the great arteries. The large vessels that carry blood from the heart to the lungs, and to the body are improperly connected. He was admitted to Hanoi Heart Hospital in a serious state. "We'll perform an arterial switch procedure. This is a very tough case," said Nguyen Trung Kien, head of the paediatric department. Viet's parents are still in debts after four operations and do not know where to keep borrowing money while Viet's operation is also urgent. "We are farmers but I can hardly work now as I have to take care of Viet. My husband works as a bricklayer too. We need VND100m this time but we can't borrow from anyone anymore," Thuy said. Five years with four operations have worn out Thuy. She hopes this last operation will make Viet healthy and be able to go to school. 1. Code 3155: Nguyen Thi Thuy from Village 7, An Lao Commune, Binh Luc District, Ha Nam Province.